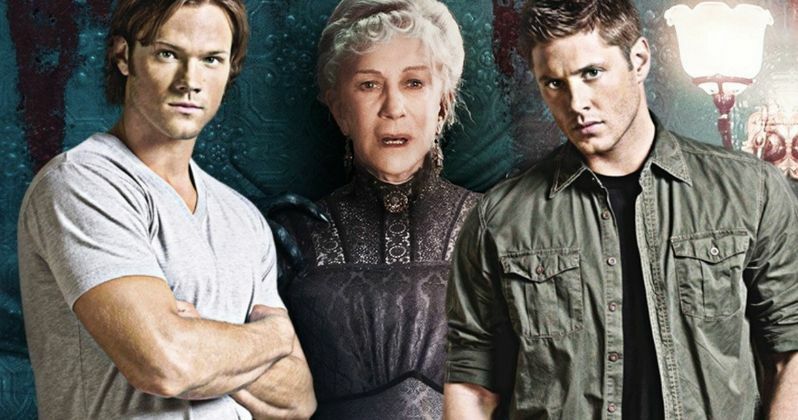 Lionsgate will roll out its new horror movie Winchester this weekend, which seems to be causing some confusion for fans of the hit CW Network series Supernatural. Even though Supernatural stars Jared Padalecki and Jensen Ackles do not appear in the movie, which is based on the true story of Sarah Winchester, heir to the Winchester rifle fortune, and the bizarre haunted house she built, there are apparently still some fans who think Winchester is a Supernatural movie, which the Winchester movie's official Twitter account helped clear up with three hilarious tweets, accompanied by brief new promos. The irony of this Winchester/Winchester joke is that CBS Films produces Winchester, and Supernatural airs on The CW Network, which also falls under the CBS corporate umbrella. Also given how both the Winchester movie and the Supernatural series deal with ghosts and other paranormal entities, it's not surprising why some fans have been calling for the Winchester Brothers from Supernatural to show up in this movie. Still, Supernatural's characters are fictional, while the real Sarah Winchester did actually build a real Winchester House and the movie is set in 1908, but that hasn't stopped fans from asking for a crossover, which lead to these hilarious promos. The Winchester Twitter account posted a video on January 18, while stating, "Yes, her name is Winchester. Yes, she battles supernatural evil. No, there are no plans for a cross over but it would be epic." That lead to a number of fans asking where Sam and Dean from Supernatural are in this movie, which lead to that same video being re-posted a week later, along with two more, that poked some fun at a potential Winchester and Supernatural crossover. Here are the last two of Winchester Twitter's hilarious tweets where they shoot down any crossover speculation. "No, the brothers do not show up in Winchester. This is a feature-length movie, not a short film and if they teamed up with Sarah the three would wrap things up in minutes. Maybe we are all overthinking this and it is as simple as people that are named Winchester love battling evil ghosts." Winchester takes place on an isolated stretch of land 50 miles outside of San Francisco, where the most haunted house in the world sits. Built by Sarah Winchester, (Academy Award-winner Helen Mirren) heiress to the Winchester fortune, it is a house that knows no end. Constructed in an incessant twenty-four hour a day, seven day a week mania for decades, it stands seven stories tall and contains hundreds of rooms. To the outsider it looks like a monstrous monument to a disturbed woman's madness. But Sarah is not building for herself, for her niece (Sarah Snook) or for the troubled Doctor Eric Price (Jason Clarke) whom she has summoned to the house. She is building a prison, an asylum for hundreds of vengeful ghosts, and the most terrifying among them have a score to settle with the Winchesters. Winchester is slated to open in over 2,300 theaters nationwide, although we'll have to wait and see how it fares at the box office, going up against last weekend's winner The Maze Runner: The Death Cure. Take a look at the tweets from the Winchester Twitter account, where they try to clear up the confusion between this upcoming movie and the hit series Supernatural. Related: Can Winchester Shoot Down Maze Runner 3 at the Box Office? Not directly but we like to believe that if they met, there would be serious mutual respect. It's a CBS/CW joke...they're the brothers on the show Supernatural. It's all love...CW/Supernatural are our (corporate) cousins and it's just a funny coincidence that the brothers and Sarah share a last name. Nope but it does involve a person by the name of Winchester battling evil supernatural forces.